For some time, my parents were undocumented, struggled financially and did not always have access to basic services, such as medical care. We did not have preventive care, rather we visited doctors and clinics when something wasn’t feeling right and the pain just wouldn’t go away. There were times, where for different circumstances, i.e. lack of transportation, urgent needs made us take drastic measures. For example, I remember walking into someone’s garage for dental treatment. That memory stayed with me, as it was something that just didn’t look right — it had all of the furnishings but it was inside a garage. Unfortunately, we were not the only family there, others were also visiting and using these services. What is the Health Insurance Landscape for Children? How Can Your School District Add the Question to Annual School Forms and Identify Uninsured Children? Estimate the Number of Uninsured Children. Determining the number of uninsured children living within your schools district's boundaries is essential for making the case to your school district leadership about the need to engage in this work. Once done, reasonable targets can be set for the number of uninsured children you seek to enroll. Learn how to obtain data from the U.S. Census Bureau to estimate the number of uninsured children in your school district. Add a Health Insurance Question. Work with your team to develop and add a question about health insurance to a form parents are already required to complete annually. Is it the school enrollment form? Registration form? Emergency or health card? Use the CDF/AASA Health Insurance Template to determine the best language for your school district. Be sure to also include language obtaining parental permission to contact them to follow up about health insurance. Use the School District's Data System. Once the mandatory form has been filed by the parent or guardian, it’s critical that the district office(s) transfer any data captured on paper into the district’s electronic records system. Maintaining up-to-date information in a safe and secure database that allows key school personnel to access the data will yield better and more coordinated action. For districts that already have electronic enrollment systems and require parents to enroll their students online, consider making the question about health insurance a mandatory field to ensure all parents report their child's insurance status. Homeless children and children in foster care. Consider options to reach homeless children and those in foster care through your district's homeless liaisons and foster care points of contact, partnering with service agencies and providers, and adapting any special intake forms your district may already use with these students. Pregnant and parenting teens. Does your district have special programs for pregnant and parenting teens? If so, these programs present an opportunity to inquire about health insurance and help connect not only the young parents, but also their newborns. How Does Immigration Status Impact Eligibility for Health Insurance? Children from immigrant families. Immigrant children are more likely to be uninsured, and their families may be unaware of programs for which their child may be eligible. 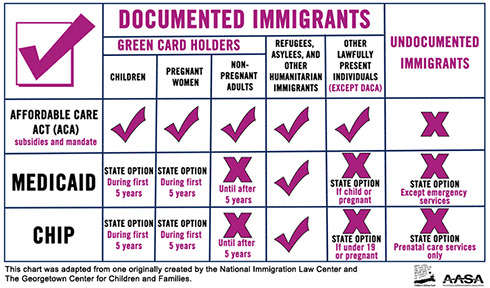 Undocumented parents may be hesitant to apply for insurance for their child even if their children are citizens, out of concern about deportation. Often schools are trusted messengers for these immigrant families and can play an important role in educating immigrant families about their child's health insurance options. However, this can be very confusing; so this special excerpt may be helpful. Children of school district employees. There may be district employees with children who are eligible for but not enrolled in health insurance. Share information about outreach and enrollment opportunities with your part-time and hourly waged employees including food service workers, custodial staff, bus drivers and others who may not have access to employer-sponsored health insurance for themselves or their dependents. When seeking to enroll uninsured children in health insurance, it is a common practice for schools to work with external partners and agencies. Therefore, it is very important that school personnel understand the importance of parental consent and put into place the necessary protections for data sharing. Patient health care records maintained by schools are considered education records and are subject to the Family Educational Rights and Privacy Act (FERPA)19 and not the privacy portions of the Health Insurance Portability and Accountability Act (HIPAA).20 Under FERPA, a school district may disclose personally-identifiable information from a pupil record with written consent from a parent, guardian or adult pupil. Therefore, when amending forms to add a question about health insurance, we recommend adding an additional question regarding parental consent immediately following it. The Department of Education has developed a data-sharing toolkit that helps simplify the concepts of FERPA and its parameters relative to the sharing of personally identifiable information from education records.21 HIPAA generally covers medical information maintained by or for what is called a “covered entity.“ The two types of covered entities under HIPAA of interest here are health coverage plans (like Medicaid or CHIP) and health care providers (like a doctor or hospital). HIPAA’s privacy rule requires covered entities to protect health records and other identifiable health information by using safeguards like requiring a child’s parent or guardian to sign before sharing a copy of health records with anyone. HIPAA also gives parents rights over their child’s health information, including the ability to obtain a copy of their child’s health records and correct any misinformation. Watch this two minute informational video from the U.S. Department of Health and Human Services to learn more about HIPAA. Houston ISD’s Coverage Map was a result of the district’s interest in expanding health services throughout their schools in a cost effective manner. The size of their district (283 schools, 215,000 students) and the variety of partners and community services working with them made it important to develop a visual perspective to identify areas of greatest need. The Manager of Health and Medical Services met with Houston ISD’s demographer to discuss the vision and provided specific information about existing health services and their target areas.